10. The final 2 borders and the border cornerstones. The quilt has been turned so that the final two borders can be stitched. This makes it easy to adjust the full length of the pattern and stitch it in just two parts. Having turned the quilt, it’s then necessary to turn the image on the screen. This project was a square quilt so it wasn’t really necessary to turn the image – if it had been rectangular it would have had to be turned. Whether it’s turned clockwise or counter clockwise is up to you. Pay attention to the way you turn the quilt on the frame and turn the image the same way. This is a good habit to get into for those times when a quilt isn’t symmetrical, for instance when it may have piecing on one end of a border. Align the quilt map off to the side. In the video I mark on quilt the top border with diagonals at the corners. Don’t do this – follow the better method below. The video does not show the pattern being stitched although I do talk about the different ways to sequence the patterns. Upon stitching I discovered that my quilt moved quite a lot so that made me think of a better way to both mark my blocks and how to sequence the stitching. Follow this new method instead of the way I do it in the video. 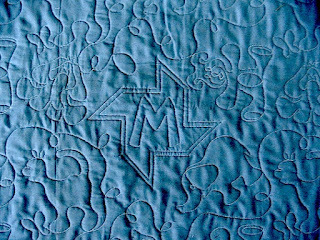 A better method for marking and stitching the border block on a turned quilt. Mark along the seam line until you reach the stitching at the left hand end. Mark along the stitching out to the raw edge, as shown here. Copy the feather patterns from the map and move them to the new block. Modify them as necessary, just as I did in the video. Match the center of the feather pattern to the center of the block and then move it down into position. Zoom in to check the distance between the seam line and the pattern. Look at each end. Make the pattern to be stitched meet up with the marked end of the borders. Change the width then use stretch, as shown in the video. Here are my screenshots of the pattern in the new block, before and after modification. The left hand end needed more modification than the right hand end. I changed the width then selected the left hand feather and used stretch to match it to the previous stitching. The distance was too great between the border and the pattern so I used shape shift to bring that portion down. I only needed to use stretch at the right hand end after altering the width.. Stretch can alter the scale of the pattern but when you use it to make minor adjustments such as this, the difference in scale is very small and not noticeable. Here is the whole border. Sequence the feathers. After stitching one half of the feather pattern, align to the center (as done in the first video about stitching the top border) then move the needle to the stitched side, placing it over the stitching where it needs to match the yet to be quilted pattern. Set zoom to true size and look up at the screen to see if it is where it should be. (I do this in the video when modifying the pattern) If there is a big difference, back out to the modify pattern page and alter the pattern. If there’s only a tiny difference, be prepared to move the fabric slightly as the stitching approaches the end, Remember, the fabric will draw up. Stitch the second half of the border pattern. After stitching the feathers, back out to add/edit pattern > delete pattern > touch the feathers that have been stitched to get rid of them. Finished > add/edit block > delete block > touch the border block > finished. Add/edit block > add block > standard block > mark on quilt. 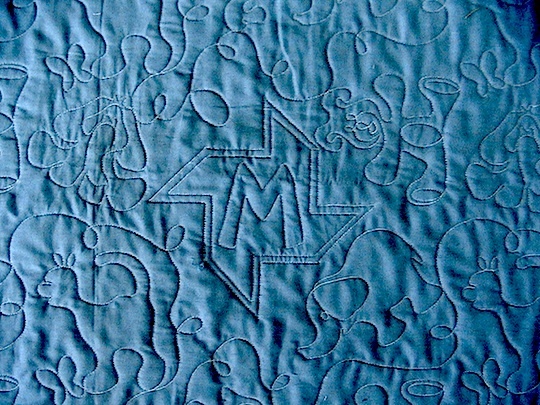 Mark along the stitching and the outside edges of the corner. 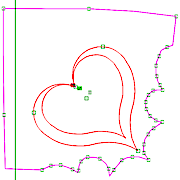 Add/edit pattern > copy pattern > move the heart into position. Refer back to your quilt map to see the way you originally placed the heart so you can match that on the real quilt. Back out and mark the other corner block, move the heart pattern and stitch it. Advance your quilt and mark and stitch the bottom border in the same way. Here is the video. Ofcourse, it's the last part of the project - not what I say in the video! If you prefer to watch it on youtube, this is the link. There’s no video this time because I think there’s no need to demonstrate modifying the border pattern to fit the real quilt, but here are the steps with reminders about which tools to use to make your pattern fit the real border. I am not including complete step by step instructions, but you can refer back to the first installment where we stitched the top border for help. 1. Retrieve the quilt map and align it off to the side of the real quilt. 2. Mark on quilt the real border block. Remember to mark the ends on the diagonal just as we did in the first installment. 3. Copy the border patterns. There are two with each one starting at the center of the border. 4. Move them into place, matching the center of the pattern to the center of the block. Use the down/up arrows to move it into the correct position, close to the inner seam line. Use the measure tool to check the distance. 5. Zoom in and pan along the whole length of the border to check the distance between the seam line and the border. Move the patterns up or down as necessary to get the majority of the pattern in the correct position. 7. Pan along the whole border while zoomed in to find places where you might need to use shape shift to move parts of the pattern. Alter the size of the effect circle to suit the size of the piece of pattern you want to alter. 8. Check that the pattern’s center is still at the center of the width of the border. 9. Pan along one more time when zoomed in. Zoom out to look at the whole border – does it look good? 10. Once you are happy with the way your pattern looks, proceed onto the stitching sequence page and set the patterns to stitch out from the center, first one half of the pattern, and then the other. Select stop to cut threads as the transition. 12. When all the stitching is completed, remove the quilt from you machine. Turn it 90º and re-mount it so the unquilted borders are at the top and bottom. There will be a video for the next installment where we will finish the quilt. If you need to watch the video to remind yourself how we quilted the first border, select ‘project’ in the side menu and all the installments will be sorted so you can find that first video easily. If you have any questions, please e-mail me or ask at the yahoo iQ forum, on facebook, or at MQR. I check all 3 daily. Simple Custom Quilting. iQ Project #1. 8. Placing the second row of horizontal sashing. This video doesn’t need many notes. I mark on quilt the sashing block, and then copy the horizontal sashing patterns. I use stretch and shape shift to make them fit nicely in the sashing block. I also talk about when I use distort, shape shift and magnet tool. After completing this part, I think everyone should be able to complete all the sashing and block patterns, but if you have questions or need me to clarify something, please ask here or e-mail me so I can make another video before getting to the bottom border. This is the link to watch the video on Youtube. An iQ owner following the project asked some questions on facebook. Although I answered her there, I thought it might be useful to others to answer them here too. I have paraphrased some of the questions. 1. You mentioned burying the threads, do you like to bury threads always or does it depend on the quilt or only on custom quilts? I nearly always bury thread ends simply because it gives me the best results. I tried back stitching and doing tiny stitches very close together, but they always looked lumpy and very noticeable, and they would always come loose when I picked at them. I've buried threads since getting my machine in 1997. I bury them as I go and it takes me very little time. These days, I can do them faster because I'll bury while iQ is stitching. 2. What kind of thread are you using for this project? I am using a polyester thread. It's a cone I must have acquired along the way - it has no makers name, so is a bit of a mystery. It might be Priced Sew Right overlock thread that a friend gave me. 3. I noticed you have your IQ speed and detail set high, if I sew at those speeds the thread breaks. Pay no attention to where I have the speed and details set. You all know your own machines and where they stitch well. Set them to suit you and your machine, and to get the best results. If that's significantly slower than mine, that's o.k. 4. What size needle do you usually use? I use an MR4.0 for everything. 5. 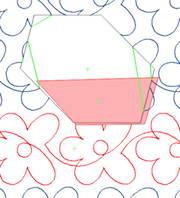 If you smooth the pattern as mentioned in the video, do you delete the original or keep it? I would probably keep the original, saving the new one with a new name, which may be the original name with smoothed added to it. 6. Do you always do a quilt map with the patterns? No. I only make a complete quilt map when I am making a quilt from scratch. Sometimes I know which quilting patterns I want to use and design a quilt to suit them. I make the map, then piece the quilt. That's the other way around to the way we usually work - choosing patterns to suit an already pieced quilt. 7. Do you ever mark on quilt and then place the patterns as you go? Yes, that's the way I usually work on custom quilts. I do go through my pattern catalogs and move any I think I might use on the quilt into their own catalog, just as we did at the start of this project. I then keep a copy of the patterns on my working screen so I don't have to keep going back to the catalog. I copy those patterns just as I'm doing in the project. (That method might make a good video after the project is completed) For this project, I thought it would be good to include making a quilt map. 8. I noticed that the patterns didn't need altering that much when copies were moved to the real quilt block. I expect to be altering the patterns more as we progress. My quilt is far from perfectly pieced, plus the fabric draw up will distort it more as we work through. I expect the borders will need modifying the most. iQ Project #1. Part 6. Stitching the first border and sashing..
6. Stitching the first border and sashing. The quilting begins in this installment and you’ll see that my stitching is far from perfect. I’m not worried because this is just a project – it’s a practice piece. If yours looks like mine, then I hope you’re encouraged to just accept it. If yours looks better than mine – hooray! I am using a high contrast thread that shows both the good and bad clearly. I chose to use it so that the stitching would show up well on the video. You can choose whatever thread you wish. My small quilt is made with old fabric that I don’t care about. I can see my finished project will be a very good, and elegant, pet bed or small picnic rug. This is a longer video because it shows everything I do. It is nearly 40 minutes long. If there are parts you need to refer back to when working on your project, make a note of their time so you can quickly find them. For instance, I start working on the sashing at about 25 minutes. I talk about the dwell settings starting at 21 minutes. There are a couple of places in the video where the image breaks up a little but they do not interfere for very long so I chose not to edit them out. They do not make you miss anything. Also, you may here me speaking softly once or twice – this is of no importance either because I am just talking to myself, saying my thoughts out loud, so don’t worry about trying to hear what I’m saying. This is the link if youprefer to watch the video on youtube. So let’s get started with the notes. As before, I am giving you a basic guideline, not every single step. If you have questions, you can refer back to the video, comment here, or e-mail me. Start up your iQ and retrieve your project, using add/edit existing. You are asked to touch a reference point on the screen – I touched the top right hand corner of my project. When asked to move the machine to that reference point on the real quilt, I did not move my machine to the top right corner of my quilt. Instead I moved my machine to the top left, beyond the edge of my real quilt. I do not want to work with my project map directly over my real quilt. I want to be able to copy the patterns from my project map and move them onto my real quilt blocks. The real quilt will not be perfect. If I try to mark my real blocks on my project map, I will become very confused. Mark the top border block, tracing along the seam line between the border and the sashing and making a diagonal line, or miter, at each corner. Mark as many points as necessary to truly reflect the block on your tablet. Add/edit pattern > copy pattern(s). Touch the two feather patterns in the top border. Move the copies over to the border block, using the arrows to move them precisely into position. Use the measure tool to check the distance between the bottom of the pattern and the seam line. Use zoom true size to get a good visual of how the pattern is sitting in the border block. Pan to each end to make sure the pattern isn’t crossing over the miter. In the video, I only had to move my patterns. If you find that when your pattern is the correct distance from the seam line, it overlaps the miters, touch width and then the minus sign to shorten the pattern. Stay zoomed in to one end as you do this. Pan over to the other end to make sure it’s correct. When you are happy, touch finished > finished > sew quilt. Touch the pattern on the left as the first one to stitch, then touch the other half of the border. Choose stop to cut threads as the transition. This border will be stitched from the center outwards. This minimizes the fabric movement. However, before stitching the second half, touch realign and follow the directions to make sure the pattern will start exactly in the center. In the video, I let the machine move to the center before realigning. If it had moved to the correct starting position on the quilt, I would not have needed to realign. I made some changes whilst iQ was stitching. I had not checked my tension before starting so it is less than perfect. 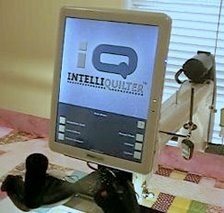 I also found that my quilt was vibrating, which was probably due to the fact that my machine has been moved from its normal position recently. After completing the top border, add/edit pattern > delete patterns. They’ve been stitched so they are not needed anymore. NOTE: do not ‘select all’ when asked which patterns do you want to delete. Selecting all will delete all the patterns on your project map! Leave the block for now. Finished > Add/edit block > add block > standard block > mark on quilt. Take a marking tool, and mark the center of each cornerstone of the top row of sashing on your quilt. When you mark on quilt the sashing block, mark it so that it dips down to the center of each sashing cornerstone. This will help when placing the patterns. When you have finished marking the sashing block, look at the screen. Has it overlapped the border block? If it has, that’s showing how the fabric moved when it was quilted. You can delete that border block now. Add/edit pattern > copy pattern > touch the first row of sashing patterns – you need to touch all 6 because they are not combined. Move the copies to the sashing block. Zoom to true size and pan along the row to check their position. Use move and/or stretch to move the patterns into place. Stitch the sashings from the center outwards. Watch as they stitch. If the double stitched line doesn’t seem to be perfect, press down on the quilt slightly to move it to make the stitching go where you need it to be. There is no need to save this quilt when you exit out and shut down. Your complete project has been saved already.